When someone says do your best, what kind of images does that conjure up for you? For those in school, does it make you feel as if you have to make all A’s? At work, does it mean continual advancement in your job? In relationships, does it mean giving more than your partner? For parents, does it mean giving your kids everything they want? What does always do your best mean to you? Miguel Ruiz in his book The Four Agreements states that the fourth agreement is “Always Do Your Best.” In his book, he talks about what that should mean to us and how to apply it to our lives. 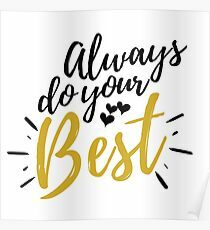 Always do your best is different for every person and it’s different every moment of every day. Sometimes, your best may be to just wake up in the morning. Sometimes, your best may be to get out of bed. Sometimes, your best may be getting dressed. Sometimes, your best may be not wanting to harm yourself. Sometimes, your best may be thinking one positive thing about yourself or your life. Your best is whatever you can manage to do, think, or feel that day that may make your life even one atom better. We constantly beat ourselves up for “not doing our best.” This best that others put on us or we have put on ourselves by making agreements that this is what the best is and only this. Anything else and we feel less than, we start to place blame on ourselves, we start to talk negative to ourselves, and we do not see anything else as our best. Because we believe the agreements we have made about what is actually our best. If you have been staying in bed all day due to depression or illness and you get up out of the bed today – that is doing our best – in that moment and you should be proud of that, be positive with that, allow that to be okay. If you have been staying in your house every day due to anxiety and you decide to walk out onto your front porch or steps – that is doing your best – in that moment. Take possession of that, make agreement with that, be positive with that and allow that to be okay. Always doing your best will change from moment to moment and situation to situation. If we can stop putting the past agreements we have made with others and ourselves onto every choice, we can start to feel better about our best that moment, start to be more positive about our best that moment, and those moments will happen more and more often until everything we do is always our best and we agree with that changing our lives for the better. What is doing your best in this moment? Make that agreement, feel that positivity, change your beliefs, and step into always doing your best and being okay with that, whatever it may be.